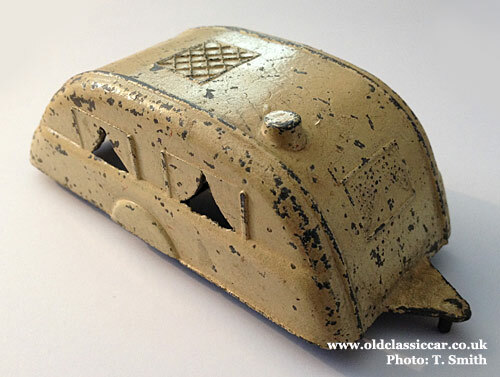 Diecast vintage toy caravan from the 1930s (Kemlow). 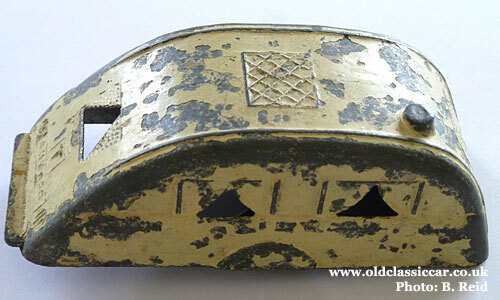 A rare pre-war diecast toy caravan. This old toy (my unpainted example, shown above) turned up in a junk shop in the early 1990s, and until 2014 I'd never seen another. 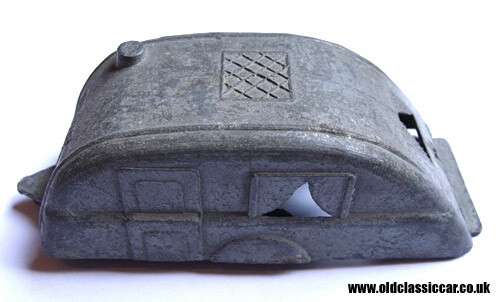 There are no real clues as to who made this caravan, the underside of this diecast toy features the words "Made In England" in a circular mark, but no hint of the manufacturer's name. At some point in the past a steady hand has carefully cut out the side and rear window openings, but left the front window alone. It wouldn't be until 2014 that the mystery of who produced this toy, was finally solved, of which more anon. The style of the caravan is very much 1930s in inspiration. 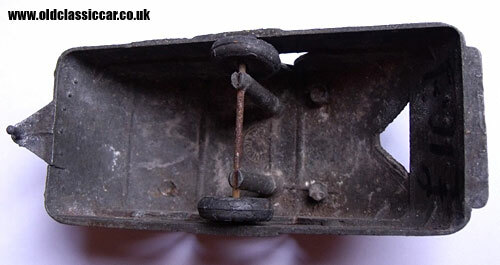 A "T" trailer plate is shown fitted to the rear, as is the registration AHY 880. AHY is a Bristol-area issue, from 1934 or 1935. Does this relate to the maker of this toy? 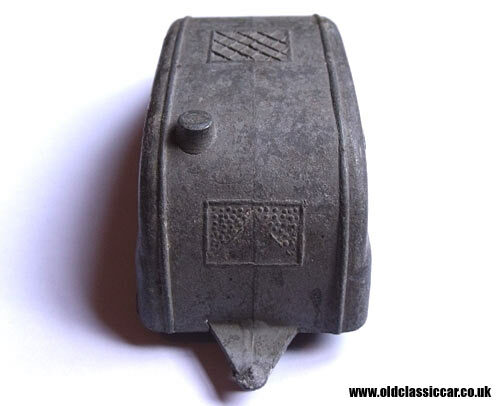 Overall, it measures five inches in length, and originally was painted a light grey colour although most of that has disappeared, revealing the base metal colour underneath. In August 2014 Terry dropped me a note, as he too owns one of these rare caravans. 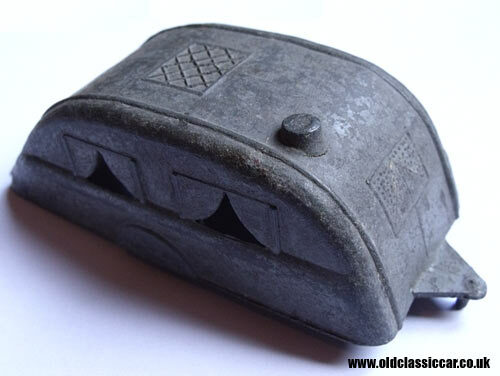 His retains most of its original cream paint job, as shown above, and coincidentally also has the cut out windows. Maybe this is how they were sold? It was certainly interesting to hear of another surviving example, although at this point the maker had still to be identified. Thanks for sending the photo Terry. Shortly after publishing Terry's photos, Brian got in touch with photos of his example, also still bearing some cream paint. Interestingly though, his bears the maker's name - Kemlow. This would seem to have solved the mystery surrounding the maker of both mine and Terry's toys. 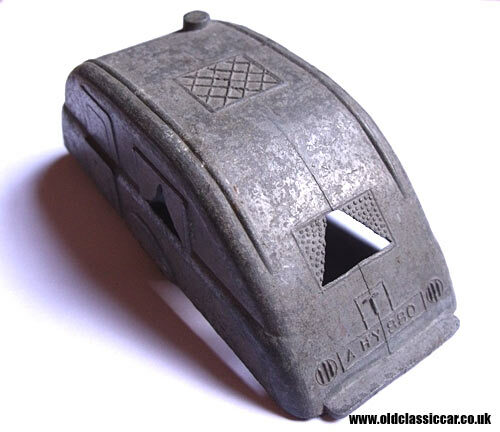 Or, did another company buy the moulds and continue production of the Kemlow toy for themselves? Brian's help is appreciated. Brian identification meant that more research was now possible. The firm was established in 1946 by Charles Kempster and William Lowe, with their factory being located in London. They also produced toys under the names of Master-Models, and Wardie Products. The caravan was sold both on its own, and also as part of the Fleetmaster Saloon Car Set. 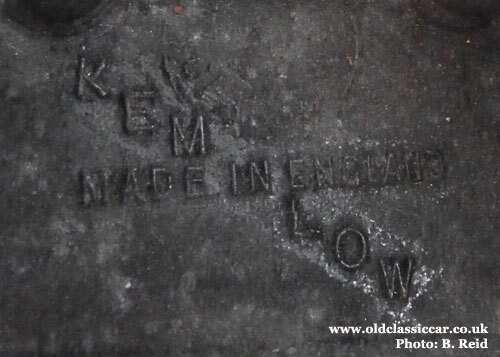 Kemlow survives to this day as a diecasting company, although no longer making toys.